As usual a weekend of pure fun, meeting old and making new friends, discovering Nuremberg, having delicious food, beer and many other things! Welcome on the official Website for the BIG Franconian Meeting. The CouchSurfing Community from Franconia is happy to welcome you to this lovely event. Our Preliminary Program is online now! 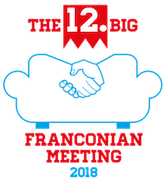 This year the 12th Editon of The Big Franconian Meeting will take place on a new date. We are working hard on this years program.